For this is exactly what this entrancing new novel achieves. It is, as you read, as if all the preconceived ideas of this country’s history of Black and White relations fall away and a new paradigm takes their place. What if, Scott asks, the benefits of White Settlement and indigenous expertise were mutual and equally valued? What if there were a genuine friendship of equals? What if the companionship of children grew into adult love across the colour bar? What if the Noongar landlord had been welcome in the houses that the White Man built across his land? And, is it too late now? Effortlessly, these new ideas insinuate into consciousness. Bobby Wabalangay dances his way through this novel challenging the sourness of the History Wars. He offers a new way of looking at the past and at the future. Scott has the moral authority to play with these ideas because he is a descendant of the Noongar People who have always lived on the south coast of Western Australia where the early whaling settlements were. Like Bobby he speaks both languages and listens in both. The landscape of this ruggedly beautiful part of Australia is superbly evoked. It is both welcoming and hostile. Hunting and gathering is easy; farming is not. A voyage to explore new prospects becomes a harrowing quest for survival across a ‘waterless’ plain ; a child drowns in a crafty rip. Both cultures rug up against the wind and rain that blows in from the Antarctic; both seek shade in the scorching summer heat. In the early days there are moments of mutual incomprehension between Noongar and usurper but mostly good relations prevail. So the first moment of betrayal comes as a brutal reminder of what was so often done to indigenous women by the rough men who became sealers and whalers at that time. But the balance of power lies then with the Noongar: there are more of them and the settlers are few. Skelly becomes an unlikely Christ when he is asked to bear the burden of a ritual spearing rather than impose British Justice on his assailant. A clever irony by Scott, that Skelly – a convict – is there as a result of British Justice in the first place. Dr Cross, who leads the First Contact settlement, is a wise man. He and Bobby are united in their desire to give-and-take and live-and-learn from each other. When Cross dies, he asks to be buried beside his friend Wunyerun and we see the impact of his death immediately when a memorial is erected to him as a founding father – and there is no mention of the Noongar man buried beside him. This is an intimation of trouble that lies ahead, for the settlement needed charismatic leaders on both sides and now it had only one. Now the entrepreneurial Chaine has an ally in the replacement for Dr Cross, Governor Spender. The settlement encroaches on hunting grounds and both black and white feast on an abundance of whales as never before, while the balance of power gradually shifts. Bobby’s naive expectations fall away as he becomes an adult; Menak and Manit lose the respect due to them as Elders because working with the white men gives Bobby and Wooral the opportunity to ‘get out from under the Elders and become aware of other possibilities’ (p337). British Justice is a flawed idea in the hands of men with flaws, but perhaps with Bobby’s final dance it could have offered redemption too. 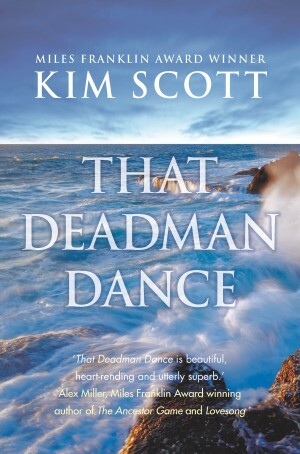 With the character of Bobby, Scott plays with time and space, death and resurrection, weaving cross-cultural ideas through the narrative so that the reader is not quite sure how Bobby-the-Tourist-Guide fits into any modern chronology of events. In the end it doesn’t matter. The reader is shaped by the story. Morag Fraser has written a superb review for the SMH and Martin Shaw at Readings thinks it’s a contender for the Miles Franklin. So do I.
Update: 19/7/14 Yes, That Deadman Dance did win the Miles Franklin but its merits were swamped by a debate about gender politics and literary prizes. So I was very pleased to see this book treated to a fine analysis at The Conversation. Source: Personal library, purchased from Benn’s Books, $49.99 AUD. (Click the link to Fishpond above for availability in Australia or click here for eBooks). Sounds like a must-read Lisa … maybe this is your year for tipping the Miles Franklin! Shortlisted at the very least! Although occasionally I felt it could have been trimmed back, mostly I loved this book, which I’ve only recently finished. I agree with you its strengths are how it raises these ‘what if’ questions, and the wonderful evocation of the landscape. It’s wonderful, isn’t it? I still feel a warm glow when I think of it.